The progressive is soaring and it’s time for you to go for it! 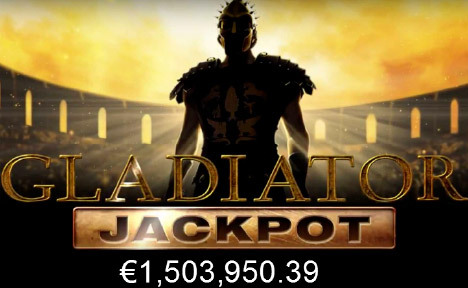 Gladiator Jackpot is a 5-reel, 25 payline game is based on the mega hit movie Gladiator and you can play it instantly on your your mobile or tablet device, as well as on our website or download version. Triggered when you get three Gladiator Helmets. Nine helmets in either gold, silver or bronze are revealed to give you cash prizes. If you trigger the Gladiator Jackpot feature during the free spins, you cannot win the jackpot – the jackpot can only be won when triggered from the base game. However, if you reveal 9 Gold helmets, you will win the progressive jackpot! $40 Gets $60! On Sunday from 00:00GMT until 23:59 GMT, all members on their deposit of just $/£/€40 or more will receive a $/£/€60 bonus. Triple $50’s Monday! From 00:00GMT until 23:59 GMT, all members on their deposit of $/£/€50 or more get a $50.00. Claim 3X. 133% Big Money Tuesday! From 00:00GMT until 23:59 GMT, all members on their deposit of $/£/€30 or more will receive a 133% bonus up to $133.00 bonus. Kicked-Up Thursdays! From 00:00GMT until 23:59 GMT, all members are invited to receive ONE of four bonuses based on your deposit amount starting at just $/£/€ 30 or more.